FREE Absorbine UltraShield EX 32 oz. Spray Trigger when you purchase a Gallon size! $32.09 Value! While Supplies Last. Tired of spraying your horses daily? Perhaps they are out in a field and not easy to handle daily. UltraShield® EX is the first weatherproof, sweat-resistant fly control protection formula that can provide up to 17 days of fly control. Pleasantly scented with Citronella to repel insects, it works on flies, ticks and mosquitoes. It's also suitable for dogs, so it can be sprayed in stalls, around the barn, and on bedding for added protection. Please note: Continuous Spray option cannot ship via air. The best fly spray I’ve used. It really does last multiple days. I recommend this to anyone who wonders if it’s truly worth the price. Yes. Yes. Yes! It works, it lasts, it worth it. Best product I’ve found and Horse.com always has the best price especially when they are running a deal. It was such a good price, I ordered more for next season. This spray is just okay. It works about as well as any other, but no better. It claims to work for many days, which is definitely an exaggeration. Have used this last year and continues to do well. Love it, kills flies on contact! I Like this Fly Spray! This is my favorite bug spray, especially against Iowa flies. Good stuff @ a reasonable price. definitely recommend it. it works. My review is for the 1 gallon refill, not the spray bottle. Ultra Shield is the best insect repellent I have ever used. It keeps the flies and ,mosquitoes off and seems to be the least toxic of all the effective sprays. Also it attracts the least amount of dirt and leaves my horse's coat clean and shiny. I buy it by the gallon and put it in a good quality sprayer - the Ultra Shield spray bottle siphons and leaks spray out while it is sitting on the shelf . This is one of the more expensive brand of fly sprays out there. I got it because I borrowed my friend's bottle and it was keeping the flies away from my horse. But there is NO WAY it lasts for as long as 17 days like it claims. Flies come back after each ride and I have to reapply. But I am glad to read this product is safe to use on my dogs as well. Horse .com has the best prices! As you spray your horse any fly that is on the horse falls off. Seems to work best compared to other brands I have tried. I received a free spray bottle also, can't beat Horse.com! This fly spray is the only one I use. Works Fantastic ! This is the best fly spray I've ever used! It lasts for several days, & now, after several weeks of use, we have hardly any flies! Amazing!! This is the second year that we have been using Ultra Shield. We have tried all the others from inexpensive to way too expensive. Ultra Shield seems to work the best so far. My wife is really happy with it and says it has made a big difference for our horses and believe me she is hard to please. For years I have been trying different fly sprays to aid in my horse sweet itch issue. Finally a product that works. I use a fly sheet but on the days I don't use the fly sheet, it's a great back up. We use this year round in South Texas! Our pasture horses no longer have any bare spots on bellies from flies. Lasts about a week but well worth it! All the sprays claim to "last for days". I've never seen any of them work to repel flies past the immediate few hours after they are applied, and this product is no different. It does, however, work pretty well for a few hours. I apply it in the barn when the leg flies are worst and before trail riding. It does not seem to work for mosquitoes. This spray has one of the higher concentrates of pyrethrums; that's what I look for. I got a can of this because it was on sale, and I haven't used any other product since I did. My horses don't mind being sprayed now and I don't mind the citronella smell at all. The main reason I buy the product is because it works so well! Best repellent I have used but I advise sticking to the normal spray bottles. I bought TWO of the continue spray bottles and BOTH nozzles didn't spray correctly. One barely leaked out the repellent and the other worked for about half way through the container before the nozzle also malfunctioned. It's the containers that are the issue. Not the repellent. Would love to be able to get a refund and put it towards getting two spray bottles, but I didn't think about doing that until after I had gotten frustrated and thrown them away. Both of the cans I ordered will not spray. Could be good fly spray if it would spray! Good prevention for flies, but not great for no--see-ums. This is my favorite fly spray. However, my horses are still bothered with no-see-ums, even though the label says it prevents their bite. I like the fact that there is UV in this product. It helps keep my black horse black, and my dark chocolate horse dark chocolate, although I still use an additional UV spray when I know they are going to be out in the Florida sun all day. Finally a Fly Spray that Delivers as Advertised! I have used just about every fly spray on the market, and I have been sorely disappointed in all of them. I had finally resolved myself to accepting that they just do not work here in S. Louisiana. I decided to try this spray and was AMAZED at how effective it is. I have since purchased 3 gallons of this to keep all 4 of my equines treated weekly through our warm season (which is at least 6 months). Yes, one treatment per week keeps them fly-free all week! LOVE this stuff! really helps to keep the flies and other insects at bay! First time ordering here. We only use UltraShield on our horses and when our Tractor Supply was out of stock, I had to find it elsewhere. I found it at horse.com at a great price. As a matter of fact, the price even with shipping was better than Tractor Supply. They shipped it quickly and I had it within a few days. I am happy and my horses are happy! I've used Ultra Shield fly repellent for 2 decades. I have 20 horses average - and it works on stable flies, mosquitos, deer flies, and even helps with those nasty huge B-52s. I have a horse with fly bite allergies. For years I used herbal fly sprays which I had to put on many times a day and he still ended up rubbing his face to the point of bleeding sores and scratching the fly bites on his legs until they bled. So we switched to protective clothing and he looked like a piece of patio furniture in the summer with a fly mask/sheet/leg wraps.I switched to Ultrashield EX last year and what a difference. My wonderful fjord horse, Thor, is doing so well, hardly any rubs and he mostly just wears a fly mask.This spray lasts and I do not have to spray him every day. I use it on my legs when I wear shorts to keep the flies from biting.Thank you Absorbine! I've been using this product for 3 years now. It works better than all the others I have tried. My horse is less bothered by pesky insects and returns to the barn with less ticks than other horses. Although there are other variables to factor in, it has been working better on my horse than other brands I've used in the past. Stick with the trigger rather than the continuous spray. I've used Ultrasheild EX for over 7 yrs and have never found anything better- It contains sunscreen plus it Kills, Repels & is long lasting. I won't buy anything else. It works for me. It works for my horses. I like it. It's the best I've tried. can always count on this to do the job it claims. This has been my #1 fly spray pick for years. Could count on it in the show ring, trail rides or just to use while they're in the pasture. Lasts longer that any of the other brands. A friend told me about this fly spray said it works very well and that it does. Well, it's fly spray, and it works better than a lot of the others. What more can I say? I have used a variety of fly sprays I prefer UltraShield EX above all the rest. Noseeums and Mosquitos eat up my gelding and this product keeps him happy for days. Can't say it lasts more than 3 to 5 days though. Needless to say flies don't come near him during fly season. I've been using this for several years. Ultra Shield EX I have found to be the one to buy. As others have said it doesn't last very long, but does my horse wonders through the day if I spray him. Especially of an evening when the bugs get so bad. He then will go out and eat, not stand under a tree all the time. You know it is still on your horse for when you go to bathe them, the spray rolls off of their body, so it is still there, but must lose the effectiveness. My Arab gets bumps along his neck and places where he has been bit by flies, so he has a reaction to their bites. I try to start the summer out with 2 gallons, but doesn't last through the season, so have to buy more. Gets pretty expensive, especially when your retired, but he is worth it. Only found one other brand that worked as good, but it is more expensive. I really like this Ultra Shield EX, just wish it were more cost friendly. Doesn't keep bugs away for 2 weeks, but still the best fly spray I've used in the last 10 years. Absorbine Ultrashield actually does a great job of repelling all kinds of bugs! It doesn't actually last for 14 days - more like about 7 to 10. I've tried many different brands of repellants and this product out performs all - except maybe TRITECH (they are about equal). I prefer the smell of Absorbine over Trictech, and the cost is usually a little less. It also seems to last thru sweat and light hosing or rain. I highly recommend it! Just tried this product and find it does a good job for a while. It will not last as long as advertised. However, it works well for trail rides through the woods, or at least as well as any bug spray I've ever used. I like the citronella smell. This spray is one of the best I have used. It stays on the horses even when they sweat a lot. We recently went riding in the mountains and never picked up any ticks at all. Excellent protection at a reasonable price. This stuff works pretty well. When the gallon sized is on sale, and you get the extra spray bottle for free; it's a good value. I have a horse with an allergy to certain fly bites. This is the best product I have found so far that works and buying by the gallon saves me money. Works almost as good as Fly Spray 44, this is my rotational fly spray during bad fly seasons. This fly spray works great and is longer lasting than other brands. This is the longest lasting fly spray I have ever used, and I've tried a lot of them! I chose this product because it is about the only fly product on the market that I had not yet tried. I have had little to no success with all other fly sprays that I purchased. I was pleasantly surprised with this one. It actually does what it says it will do. I need to only spray my equines down thoroughly about once a week, and it keeps most flies off of them for that entire time. It is more expensive than other brands, but it lasts WAY longer so you use less. Best fly spray for watershed area with mosquitos, gnats, flies, horse flies and chiggers. 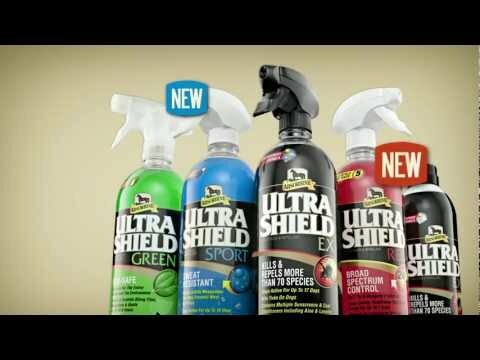 I've tried most of the fly sprays on the market and found Ultra Shield to be the absolute best. My donkey has skin allergies and I am able to use Ultra Shield without any issues. It does the job! it seems to work the best. Love it! Does not make the horse's coat gummy. Because it is supposed to be sweat proof and waterproof. works great on ticks and last a long time. I used this year before last and it worked great. I tried something different last year and it did not work nearly as well. This is a great product. This is the most useful fly spray I have tried - most of them don't seem to do much for my horses. UltraShield EX works better than anything else we've used on our horses. Nothing lasts more than a day, though, no matter what the manufacturer claims. EX smells the best and doesn't trigger hubby's allergies. This is the most effective equine insect repellent I have found. It is long lasting and worth the price, especially if you only have a couple of horses to spray. Plus, the addition of sun block is a bonus for my light colored horse. This is one of the few fly repellents I've found that has "knock down power". It works better than anything else I've found. There is no better spray than this one. I have used the rest and this is the best. It seems to work well in Texas for me for my horses. best pest control that I have ever used. It was time for replacement. I will need to order another gallon before fall. Does the job of keeping most flies off and providing sun protection. Can also be used on my dogs. I wanted to help keep flies off my horse. This is by far my favorite spray! Well worth the money! Top of the line fly spray. This is the best full spectrum, longest lasting fly spray product I've ever used. the warm weather is here and this product works to keep my horses comfortable from those pesty flies!! For my kennel, It is good protection for Dogs too. In PA UltraShield seems to work the best with flies and ticks. BEST ANSWER: All label says is safe for foalss over 12 weeks of age. No mention of pregnant mare. Check further with Absorbine Company or your vet. It maybe one of those products that has not been tested on pregnant mares. As with any chemical, caution should be used when applying. I haven't had any problems on pregnant mares. I know once foal is born you do not spray where the foal will nurse and ingest the spray. I don't know. You would have to read the instructions on the bottle. I use if on 3 geldings and a mare that is not pregnant. hi, thanks for responding. my only concern is the baby. not sure if it would affect it in any way. does not state safe for pregnant mares. some product state that. will call absorbine and ask them. if it is not safe they should state that. anyway thanks again for your input. Need to read the label. I used it on 2 QH geldings. If I order three gallons of Absorbine Ultra Shield and they are giving the smaller bottle free when you order one gallon, will I receive three of the smaller bottles? I am ordering one gallon for myself and two other gallons for two other people at the barn. Thank you. BEST ANSWER: We are not currently showing a giveaway promotion for this item. But when we do, yes, there would be a free item for each regular item ordered. I ordered 2 gallons and received 2 free spray bottles. will this repel horse flies? BEST ANSWER: As we do not have many horse flies, I can't say for sure. My guess would be no as the horse flies I've seen are pretty persistent. It does work very well on regular stable flies. Yes but doesn't last as long as advertised. BEST ANSWER: Unfortunately we do not offer price matching as our equine items are already sold at there lowest possible price. How long does the 1 g last once opened.? BEST ANSWER: We use it on 2 horses daily. 1 gallon will last us about a month. One horse is at least 16 hands and the other is 14.2.. As far as strength, we have had a partial gallon left over in the fall and it seems to be ok the following spring. We live near Houston so our winters aren't very cold. I buy one gallon per season for three horses. But, I live in the high desert and that can decrease the amount I need. I also use fly predators which helps. I don't know that it has any expiration date. I know I used it for at least a year from when I opened it. I have 3 horses so 3 to 4 weeks depending on weather and how much they are being bathed. I get two summers out of it for one horse, and I apply every other day. will this be okay to spray around the lawn to try and keep the flies away? BEST ANSWER: Sorry, I have not used it on grass, but it has not damaged any of my weeds! I put it on my dogs which are more sensitive than a lawn with no problems. Check your local outdoor store, I bought something one time for an outdoor party (price was reasonable) and it was for outdoor flies and mosquitos, and lasted many hours. I will say when I spray it on my barn walls and shavings that the flies are back in a few hours. Good Luck. It wouldn't hurt anything, but there are less expensive options for lawns. BEST ANSWER: This appears to work the best of anything I have tried yet. The flies are just pests. I think it is a great product. Lasts a long time (depending ) on the season. Unfortunately this item is not available for shipment outside the USA. What does cont spray mean on a flyspray bottle? BEST ANSWER: I don't see "cont" in the description once I get online. But "cont" in any spray usually means "continuous". It means you can press the nozzle & spray comes out as long as you keep your finger on. Suntan lotion is a good example of a continuous spray. However I've been buying this black label ultrasheild EX for 20 years & it has ALWAYS been pump, not continuous. It means it's an aerosol instead of a trigger-style pump. BEST ANSWER: It's not oily at all. I love it, it also has coat conditioning and sun block. If you're going to ride don't spray where the saddle and girth are going. No flies on my mare. I was hoping it had oil in it as it last much longer. I guess I wil sticking with pyrhana. It lasts about 3 to 4 days. can the continuous spray be refilled? BEST ANSWER: Sorry but I bought the gallon refill and Use a plant sprayer. Do i get a free bottle when ordering 2 gallons? BEST ANSWER: Sorry, will not give out phone number, but if you have a question about this product, I'd be happy to answer it. We are available 8AM-8PM weekdays, Eastern time at 888-653-0026. BEST ANSWER: There is no spf rating listed anywhere on the bottle but it is the only product of its kind that we use. It is by far the best fly spray we have ever used. I would highly recommend this product. It keeps our 3 horses insect free with bright shiny coats all summer long. You get instant results from this product. That I don't know, but this is the only spray that is reasonably priced that keeps the flies at bay. Does autoship guarantee the same price & free shipping as my original order? BEST ANSWER: It does not. Auto Ship is for 10% off the list price and the automatic timing.